A total of 728 people took their own lives in Scotland last year, an 8% rise on 2015. Poppy Mackenzie had only just turned 18 when her father died. Billy from Inverness was one of 728 people in Scotland to take their own life last year. The figure marked an 8% increase in the suicide rate on 2015 after several years of steady decline and an overall fall of 17% since 2002. Poppy still has no idea why her father did what he did. 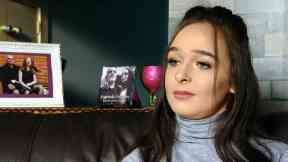 “Three days after my 18th birthday, my dad committed suicide,” she told STV. “It was very unexpected – nobody really got any signs of what was going to happen. Poppy Mackenzie: Lost her father three days after 18th birthday. Historically the Highlands has had a higher rate of suicide than in the rest of the country. With suicides most prevalent among men aged 40 to 55, Poppy believes the problem is partly generational. Whatever was going on in Billy’s mind, he never gave so much as a hint of it to his family, with Poppy describing him as outgoing, in-your-face and always telling jokes. The aftermath of his death, she says, was the worst part for her and her family. “It hurts me knowing that maybe I could have done something,” says Poppy. “I always think I could have done this or stopped him from doing that or prevented it in any way. The 18-year-old has taken the experience of losing her father to contribute to work being done locally, raising money for charity Mikey’s Line by doing a fundraising abseil in Falkirk. Mikey’s Line: Poppy Mackenzie has raised money for the charity. Mikey’s Line, an anonymous text helpline service for people struggling with depression, suicidal thoughts and other mental health issues, was also born of tragedy. In October 2015, best friends Michael Williamson and Martin Shaw killed themselves just days apart, in their own homes in Inverness, both aged only 23. It was Michael’s uncle, Ron Williamson, who decided to set up the helpline to encourage people struggling with similar issues – particularly young men – to open up. As volunteer for the charity Sheila Ross explains: “With men especially I think there’s a Highland culture of big boys don’t cry and where lassies will maybe speak to each other more about issues. “Men don’t – men seem to just bottle it all up – and the end result is suicide in a lot of cases. Funding is an ongoing issue for Mikey’s Line, which has been reliant on local goodwill to finance its latest project, a drop-in centre that will open on December 4 this year. Such “safe haven” centres in other parts of the UK are fully paid for by the health service, such as one in Aldershot, Hampshire, that Sheila visited and says is “saving lives”. “We need the money now, on the ground, for people to help these people, not for us to scrimp and save and rely on the goodwill of the Highland people,” she says. The Scottish Government announced this year an extra £35m in funding for 800 mental health workers. Campaigners say even with this, the share of NHS spending on mental health compared to other services has decreased. Is there a national strategy? 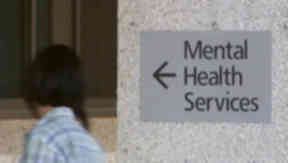 Mental health: Campaigners say services need more funding. There is also concern over a lack of a joined-up national strategy on suicide prevention. SAMH believes any new strategy should set clear targets on reducing suicides for men, who are statistically three times more likely to take their own lives than women. The group also says there should be a focus on the 40-55 age group along with under 25s and people living in the nation’s poorest postcodes. The then-Scottish Executive launched Choose Life, a ten-year national strategy on suicide prevention, in 2002. Its objectives were carried over to the Scottish Government’s 2013-2016 suicide prevention strategy. It has, among several key aims, a focus on intervening and providing support to reduce suicidal behaviour among high-risk groups. “SAMH has some concerns that the national Choose Life programme seems to have become fragmented across Scotland,” says Mr Watson. “It appears there are inconsistencies in terms of how local suicide prevention work and awareness is taking place. “I think if we have a national unifying strategy, there’s something we can all follow. Among SAMH’s main concerns is addressing the “revolving door” between police and A&Es experienced by high-risk people, who often end up taking their own lives. One person trying to tackle this is Professor Rory O’Connor, head of mental health and well-being at Glasgow University. He is coordinating a pilot scheme offering after-care services for those who have attempted suicide. Run by researchers at the university, the SafeTel programme hopes to help 120 people in Glasgow and Edinburgh over the next year. “What we’re looking at is safety planning plus telephone support to help people following a suicide attempt,” he explains. It comes after a study carried out at Glasgow Royal Infirmary in 2016 found 856 people had been admitted to A&E having attempted suicide, self-harmed or reported having suicidal thoughts. Were these figures replicated across Scotland’s hospitals, they could run into the tens of thousands. On top of this, more than a third of those patients seen at Glasgow Royal Infirmary were discharged with no follow-up support. “There’s very little out there for people who have attempted suicide and are in crisis there in the moment,” says Prof O’Connor. The SafeTel scheme plans to take patients in crisis and help them draw up “safety plans” for themselves, as well as providing after-care support over the phone. “If it’s effective we will then try and do a large-scale trial to see if actually this is an important treatment, an important intervention for people who attempt suicide,” Prof O’Connor says. Steven Fegan: Attempted suicide twice after virus put him in wheelchair. For 33-year-old Steven Fegan, who twice tried to take his own life, such a service could have been invaluable. “I wasn’t talking,” says Steven. “I wasn’t getting my thoughts out – and thoughts were going round and round and round in my head – and I was finding it really difficult to grab one of them to verbalise it. The pressure on men to be perceived as strong and as protectors was a factor in bringing him to such a low point. “My thoughts and my feelings were that the world then would be better off without me, especially the people round about me, the people that I loved and cared about cared about me,” he explains. After his second suicide attempt, Steven was sectioned. He then finally decided he needed to talk to someone and called Samaritans. “The journey from my lowest is still kind of peaks and throughs, and I still take medication on a daily basis to help with that,” says Steven. Steven now volunteers for Samaritans to give something back to the charity that helped him to open up about his mental health issues. “There’s nothing to be ashamed of,” he says. “We’ve all got mental health – sometimes it’s good, sometimes it’s bad. World Suicide Prevention Day is on Sunday. If you have been affected by any of the issues raised you can contact Samaritans on 116 123 and find more information on SAMH here and Choose Life here.